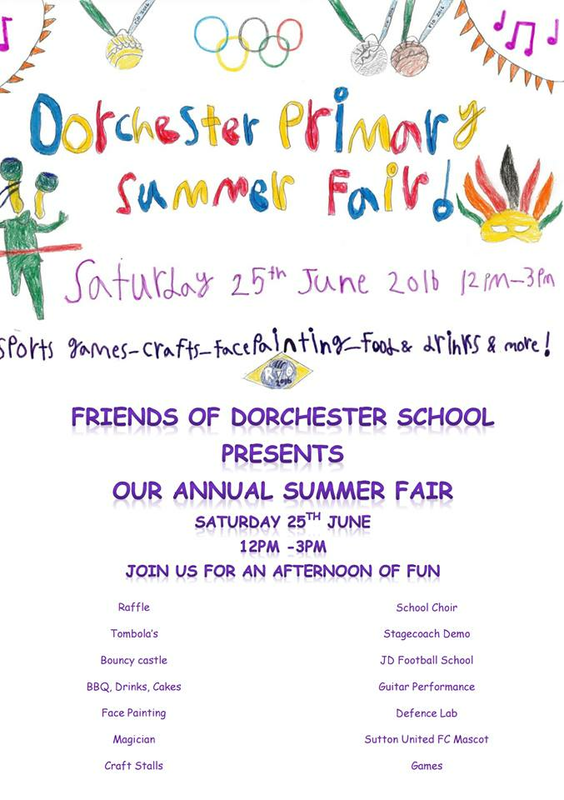 As I mentioned in the previous post, Dorchester Primary School (in Dorchester Road) are having their Summer Fair also on this Saturday 25th June. "I haven't really done much, it's all down to my amazing committee". "This years Summer Fair is set to be the best yet for Dorchester Primary School, in Worcester Park. With an excited and energised PTA team who have put absolutely everything into making this a fantastic family day out for the local community. The fair opens at 12pm & is packed full with entertainment from Dorchester School Choir, Stagecoach, Musicians, Martial Arts, Magic, crafting activities, bouncy castles, loads of activities for the kids, refreshments & a raffle with prizes to knock your socks off (although with the forecast set for sunshine you may not be wearing any), with the days events wrapping up at 3pm." I am sad that I will not be able to attend this event and see the wonderful work that so many have put in, as well as supporting WP Junior's school this time around. And so I would urge - with great urgency, anyone with any connection to the school, anyone nearby or just with any inclination to visit a school fair to go along and support the school and have a great day out into the bargain.